Father Fernand Paquet died on February 9, 2015 at St. Teresa’s Residence. He was 86 years old and a Maryknoll priest for 58 years. Fernand Paquet was born in St. Honore de Shenley, Quebec, Canada on October 10, 1928, one of thirteen children born to Albert and Obeline Begin Paquet. He entered St. Hyacinth Seminary, Quebec, in 1944, completing his high school studies there and receiving a B.A. in Philosophy in 1951. In September of that year he entered Maryknoll Novitiate in Bedford, Massachusetts. Father Paquet was ordained on June 9, 1956 at Maryknoll, New York and was assigned to the Brookline, Massachusetts Development House for two years. In July 1958 he left for his new assignment in Korea, arriving in Pusan on August 15, 1958. 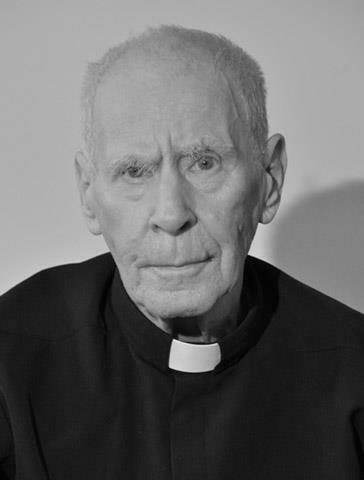 Upon completing eight months of language study, Father Paquet was assigned to Kang Wha Island to work with Father Thomas McKee and, after six months, he was assigned to be an assistant to Father Henry Sullivan in Inchon, Korea. From 1960 to 1989 Father Paquet served in eight different parishes, all within the Inchon Diocese, his last parish assignment being Song Eui Dong, Inchon. After experiencing several medical issues, Father Paquet asked to be released from this parish and assigned to a less stressful one, and so he was re-assigned to Kang Wha, where he worked when he completed language study in 1959. In April 1999 Father Paquet was granted retired status, with continued residence in Korea. He happily continued living and working in Kang Wha, covering two outstations on the weekends, until 2009 when he returned to the States. In April 2009, Father Paquet was assigned to the Senior Missioner Community and took up residence with his brother Rev. Hubert Paquet in Biddeford, Maine and in May 2011 Father Paquet moved into Mission St. Teresa’s at Maryknoll, New York. A Rosary and wake service was held at 4:00 p.m. on February 16, 2015 at St. Teresa’s. The body was received at the Maryknoll Society Center at 9:15 a.m. February 17, 2015. Father Paquet’s family received condolences and prayers until 10:45 a.m. in the Lady Chapel. The biography was read by Father David L. Pfeiffer. Mass of Christian Burial was concelebrated in Queen of Apostles Chapel on February 17, 2015 at 11:00 a.m. Father Martin J. Lowery was Principal Celebrant and Father Leslie F. Blowers was homilist. Burial followed in Maryknoll Society Cemetery with Father Russell J. Feldmeier conducting the graveside service.